Selenic acid is a colourless crystalline soluble strong dibasic acid analogous to sulphuric acid with the molecular formula H2SeO4. Included under this heading is the acid form, and inorganic salts of dihydrogen selenium tetraoxide. It is an oxoacid of selenium, and its structure is more accurately described as (HO)2SeO2. 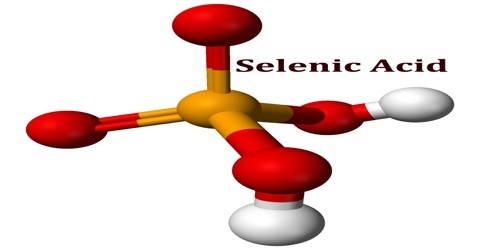 As predicted by VSEPR theory, the selenium center is tetrahedral, with a Se–O bond length of 161 pm. In the solid state, it crystallizes in an orthorhombic structure. It was first prepared by Mitscherlich in 1827, who suspended lead selenate in water and precipitated the lead by means of hydrogen sulphide. By the oxidation of aqueous solutions of selenious acid with suitable reagents, e.g. chlorine or bromine, selenic acid may also be obtained. Unlike the production sulfuric acid by hydration of sulfur trioxide, the hydration of selenium trioxide is an impractical method. 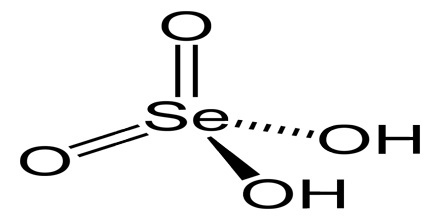 Instead, selenic acid may also be prepared by the oxidation of selenous acid (H2SeO3) with halogens, such as chlorine or bromine, or with potassium permanganate. Pure selenic acid may be prepared from the solutions obtained in the foregoing processes by first neutralising with ammonia, precipitating barium selenate by the addition of barium chloride, and heating the separated precipitate with a solution containing the correct quantity of sulphuric acid. 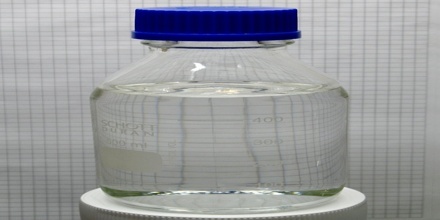 After removing the barium sulphate, a solution of pure selenic acid remains, and if this is concentrated as far as possible and then cooled to -50° C., crystallisation sets in on stirring. The same result may be obtained by heating the concentrated solution in a vacuum at 180° C. and then cooling, a crystalline mass being formed. Selenic acid reacts with barium salts to precipitate BaSeO4, analogous to the sulfate. In general, selenate salts resemble sulfate salts, but are more soluble. Many selenate salts have the same crystal structure as the corresponding sulfate salts. Selenic acid is used as a specialized oxidizing agent.